This product is available in a selection of sizes starting from 6m span up to a 16m shaded area. 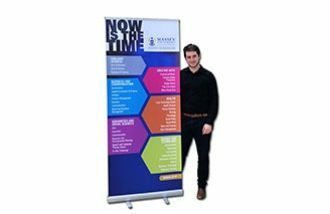 This style of promotional display is ideal for maximum brand exposure the canopy can come in a selection of colours and fabric type. The fabric can also be custom printed to include any graphics or colours. 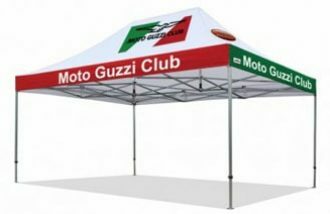 This range of tents is fast to set up and dismantle and ideally suited for use at club meetings, school fairs and sporting events. The 6m Star Shade is simple to setup shade option that offers a unique look. The structure pins out over a 6 metre diameter and erects with an aluminium central pole. The 8m Star Shade is a simple and effective shade solution that stretches to a diameter of 8 metres. The setup time is quick and easy due to the simplistic nature of the product. The 10m Star Shade is a huge central pole shade option designed to cover a large area with ease. The central pole creates a pinnacle of 5 metres and a diameter of 10 metres. The 12m Star Shade is the mid-sized tent in our star shade range. Reaching a diameter of 12 metres, this tent covers a large area and demanding presence with a 6 metre peak. The 14m Star Shade is a large scale tent designed with ease of use in mind. 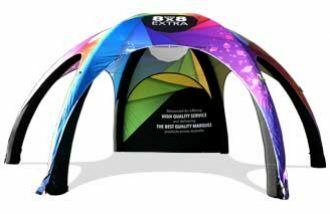 The simple concept of the tent becomes a dynamic and eye-catching promotional platform with the addition of custom printing. The 16m Star Shade offers great value for money. The largest in our single pole Star Shade range, it is definitely set to grab attention while providing a shade solution at events, sports days and festivals. Our Single Pole Star structures are perfect for fast shade and easy to set up. Star outdoor shade structures are made from a strong telescopic aluminium pole that is fitted inside the roof. Simply lift the pole into position and put the steel pins in the ground, adjust the ropes and you have instant up shade. 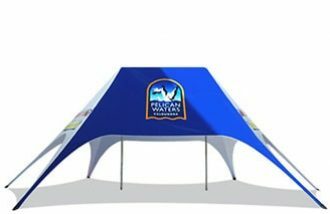 Our outdoor star shades can also be fully custom printed and great for triathlons or events where maximum brand exposure is desired.